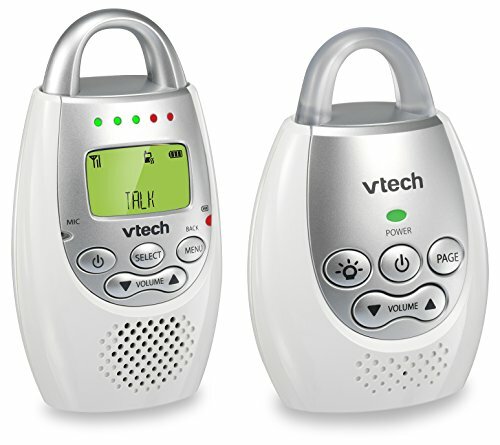 The VTech DM221 Digital Audio Monitor with DECT 6.0 digital technology provides crystal clear transmission, eliminating the annoying white noise you hear from analog monitors. The only sounds you hear are coming from your baby. Totally digital transmission eliminates background noise and prevents interference so you can rest assured the only sounds you—and only you—will hear are your baby's. Make sure the Baby Unit is turned on. Move the Parent Unit closer to the Baby Unit, but not closer than 1 meter / 3 feet. If you are using the Parent Unit in cordless mode, the battery may be low and requires recharging. A full charge takes 12 hours. Reset the system by disconnecting power from both units, waiting at least one minute, then reconnecting power. Allow time for the two units to link to each other. Nearby cordless phones or other electronic devices may be interfering with the baby monitor. Separate these devices as far apart as possible.